Sens. 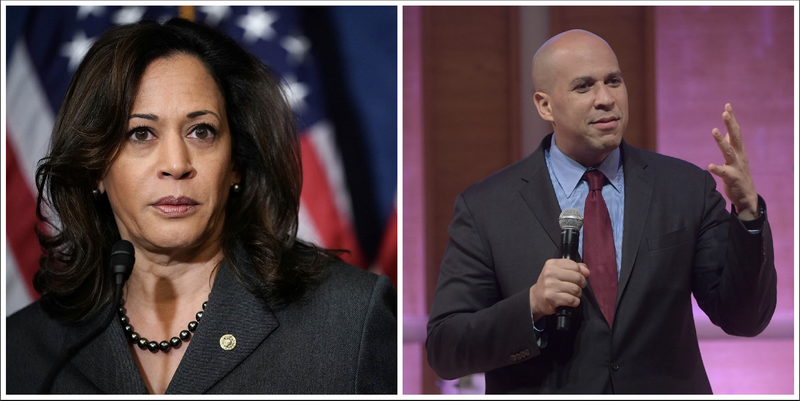 Kamala Harris (D-Calif.) and Cory Booker (D-N.J.) were appointed to the Senate Judiciary Committee on Tuesday. This is only the second time in the 201-year history of the committee that anyone black has served on it, and the first time there have been two black people on the committee at once. Mark this down on your calendars. According to the Washington Post, Harris—who is a former attorney general for the state of California—was already seen as a likely candidate to replace Sen. Al Franken (D-Minn.) on the committee after his resignation late last year. Booker’s appointment comes just one year after he testified against the appointment of then-Sen. Jeff Sessions (R-Ala.), who was awaiting confirmation for the position of U.S. attorney general. It is apropos that the Judiciary Committee is directly responsible for overseeing the U.S. Department of Justice. Booker has been one of the most outspoken critics of Sessions in Congress. He was the first sitting senator to testify against a fellow senator who was up for a Cabinet post. Fixing America’s broken criminal justice system has been a decades-long passion of mine, and the urgency with which we must act has grown with the extraordinarily dangerous, backwards policies being advanced by Attorney General Sessions and President Trump. At a time when civil rights are increasingly under assault by the Executive Branch, and when ideological extremism and abuse of the judicial confirmation process are undermining our democratic institutions, I will bring every ounce of energy I have to this position, responsible for direct oversight of the nation’s Attorney General, our system of justice, and the judiciary. Make no mistake about it—our country is at a decisive turning point. The Trump administration has repeatedly demonstrated its hostility to the ideals of civil rights and equal justice for all. As a member of the Senate Judiciary Committee, I will make it my mission to check and balance President Trump and Attorney General Sessions. At every turn I will strive to advance the cause of reforming a broken justice system stacked against the poor and people of color, and to bend the arc of our nation’s history further towards equal justice for all. I couldn’t be more excited that my dear friend Senator Harris will also be joining the committee. She is an immensely talented person who brings a wealth of skills and experience to the table. I can’t wait to work alongside her. I look forward to the chance to continue to provide a voice for our most vulnerable communities, work on issues I’ve handled since my earliest days in the Alameda County District Attorney’s office, and defend California in the face of this Administration’s repeated attacks on our values. While I will no longer serve on the Environment and Public Works Committee, I will continue to be a champion for California, which has an outsized stake in all issues relating to the protection of our environment. My commitment to fight for everyone’s right to drink clean water and breathe clean air is unwavering. We won’t pretend we don’t know that both Booker and Harris are being groomed for a run for the presidency in 2020. This appointment puts a feather in both of their caps, but it also opens them up to closer scrutiny. Still, we cannot deny the historic importance of this moment. Editor’s note: This story was updated to include a statement from Sen. Kamala Harris.